When drinking the four cups of wine, and eating the matzot, the korech sandwich, and the afikoman, one is required to recline on a couch, an armchair, or on pillows. This is how royalty and nobility used to eat and on this night the people of Israel are entitled to conduct themselves like royalty. Maimonides writes: One is required to see himself as if he had just now left Egyptian slavery. Hence, when a person eats on this night, he is required to eat and drink while reclining, as a sign of freedom. Women and men would be separated...Yeshua said if you even gaze at a women with lust you commit adultery. 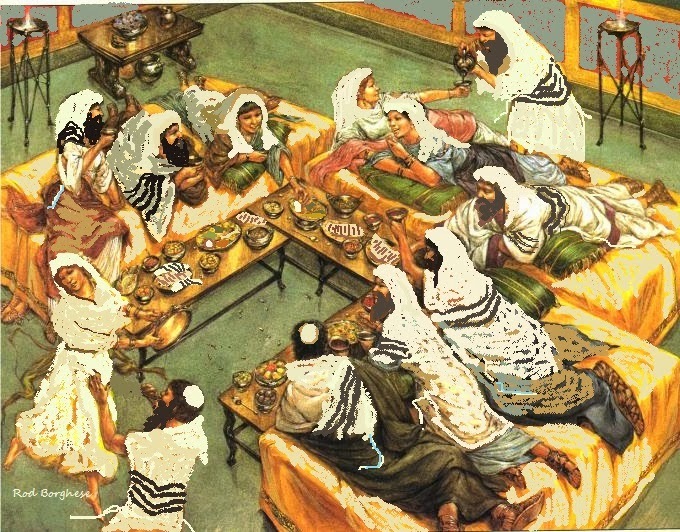 There is no way in hell a Rabbi that stringent would permit Men and Women to be laying next to each other like this on Passover.